Yesterday in Oslo was like so many winter and spring and fall days in Seattle: grey and rainy. Fortunately I got most of my outdoor sightseeing done on Saturday, when it was beautiful (until late afternoon). The day started with an outing to Bigdøy, a neighborhood on a peninsula best reached by ferry. There are six museums over there, and I hit 4.5 of them. I got to the Holocaust Center first, at 9:30, but it didn’t open until 10:00, so I took a picture of the building, Vidkun Quisling’s former home. Quisling was the head of the Norwegian government during the Nazi occupation, and his legacy is that his name is used to refer to anyone who sympathizes with the enemy during an occupation. 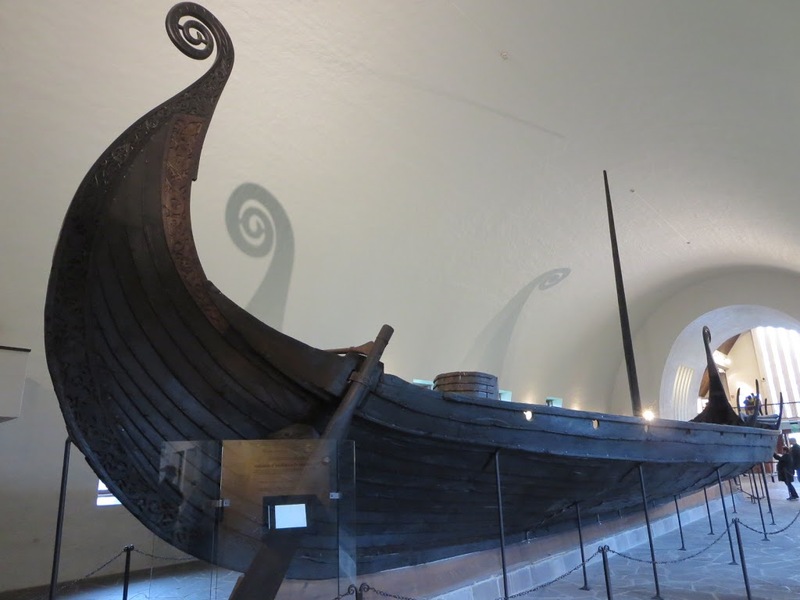 So I walked from there to the Viking Ship Museum, which houses three ships that were discovered in the late nineteenth and early twentieth centuries. Unlike the ships I saw at the museum in Roskilde, Denmark, four years ago, these ships are almost completely intact, as they were used for burials and not sunk at sea. The rain let up, so I decided to visit the Norsk Folkemuseum, one of those outdoor recreations of long‐ago life that I usually hate. But this one turned out to be very well done. It was organized into villages representing different eras, but it also mixed in some interesting exhibits showing the same kind of business in different eras. For example, there was a dentist exhibit with recreations of offices from the 1910s, 1930s, and 1960s. And a similar pharmacy exhibit, and an apartment building with six furnished apartments from the late 1800s through the late 1900s. Plus, of course, the typical array of old buildings from all over Norway. Then I hit the Kon‐Tiki Museum, which displayed the original Kon‐Tiki raft sailed by Thor Heyerdahl, and the Fram Museum, which displayed the ship sailed by Roald Amundsen. I was pretty much done with boats by that time, but I still had to take the ferry back from Bigdøy. My next stop was the Astrup Fearnley Museum. This is a museum of modern art, or perhaps a better way of describing it is a museum of wacko art. There was no Norwegian slant to the exhibit; it included artists from all over the world, including several from the USA, though the only name that was familiar to me was David Hockney. The museum is located at the end of the Aker Brygge, the area of the marina where I had dinner the night before. In spite of the weather, there was some fun activity going on (kids in blow‐up spheres bouncing around in pools of water, rock‐skipping competitions, and free samples of ceviche dishes made by a local chef. Guess which of these got my attention! Very yummy! Next stop was the National Gallery. I was all set to use Rick Steves’ book, which includes a self‐guided tour to the highlights of the museum, but I quickly discovered that the museum was completely reorganized after he wrote the book, so I had trouble finding anything. But it was an excellent collection, not just of Norwegian art, but of European art throughout the centuries. The Norwegian star, aside from the dozen or so works of Edvard Munch, was Johan Christian Dahl (1788–1857), a Romantic painter who did some beautiful landscapes. From there I hit the Nobel Peace Center. (All the Nobel Prizes are awarded in Stockholm with the exception of the Peace Prize, which is awarded here in Oslo.) I didn’t really have much time to see a lot of the exhibit, so I looked briefly through the electronic displays of all the Peace Laureates (with sensors so as you approached each one, the display changed to describe the activities of each recipient that earned them the prize. Then it was time for a quick stop at home to get ready to head to the Opera House for the Verdi Requiem. The performance was brilliant. The conductor, a young American I had not heard of, and the four soloists, all Norwegian, and the orchestra, all performed impeccably, but the revelation was the chorus, only 50 strong. When I saw how small the chorus was, I couldn’t imagine they could hold their own against a 100‐piece orchestra, but their singing was amazing and the balance was perfect. I ended the evening with one of the most memorable dinners I’ve ever had, at a restaurant called Hos Thea. I had a four‐course chef’s menu, every bite of which I wanted to savor. 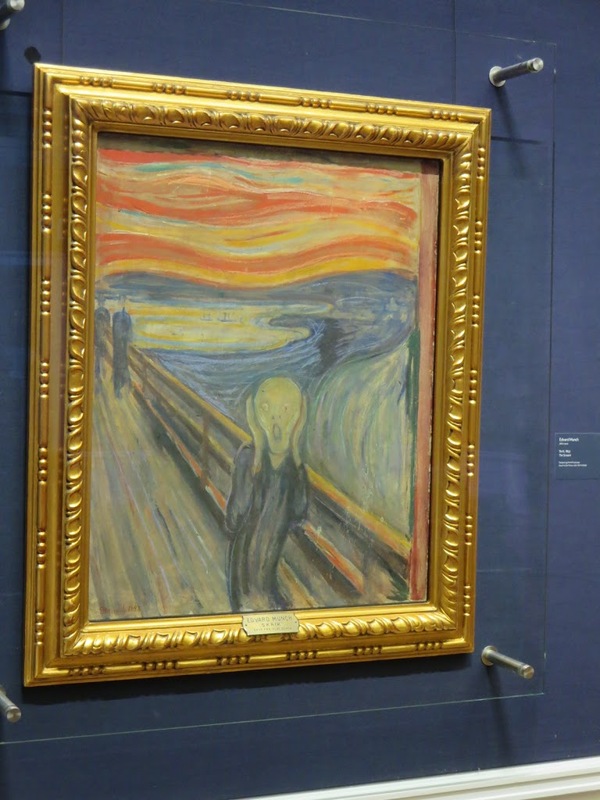 Rain or not, a fine day in Oslo and the scream is forgotten. I think you’re setting a personal record for # of museums in a day!